Sean arrived to collect his daughter to go and visit the mother in hospital, but he was thirty minutes early. She was not home yet. He went next door to chat with Greg just To Put Down The Time . Niall came to look at the heating system. With a bit of fiddling, he was able to get it all working again. The pump was not gone after all. We were relieved. We feared we might be needing a new stove and the amount of money to be spent would be huge. The hardship of a few days without heat are already forgotten in our relief. Then Ned Coady came down with his plug-in generator to fill the fuel tank. As we drank tea together afterwards he joked that Simon was off his mark. Usually Simon calls the oil company and asks for 720 litres or 680 litres or whatever amount is needed. He is always spot-on with his order. He has no gauge on the tank. He only uses a long piece of wood that he sticks into the tank and from that he makes his estimate of the volume required. He climbs up a ladder and stands on the edge of the wall beside the tank to make his calculation. It is a joke with Ned and a joke with the men at the yard and and a joke with Simon and himself that Simon is always correct. He never orders more fuel than can be fit into the tank. The tank fills to within a few centimetres with the amount he orders. The men at the yard cannot figure out how he does it. Today’s estimate was a bit off. He had ordered 650 litres and the fuel filled the tank about 250 centimetres below the top. Ned was not going to let this be forgotten. He was not interested in our days without heat and the almost broken heating system. He acted like he had won a wager. He was still chuckling when he left the house. The older woman was shorter than me and she was badly bent over. She asked me to lift a box of porridge oats down from a high shelf. She said, “I don’t like To Put In On You but I cannot reach that high.” I did not know the expression but I understood the need for help. I mentioned it to Breda and she defined it exactly in the way I had understood it. To Put In On Someone is to impose upon them. There is always another way to say the exact things that I think I already know. The path is wet and there is water running down it and there are lots of rocks covered with moss. The winter has been long and wet. The moss is everywhere. But the big branches and the brambles are cut back. It is easy to walk without getting entangled or ducking down low, as long as I look carefully at the mud and the slippery stones. 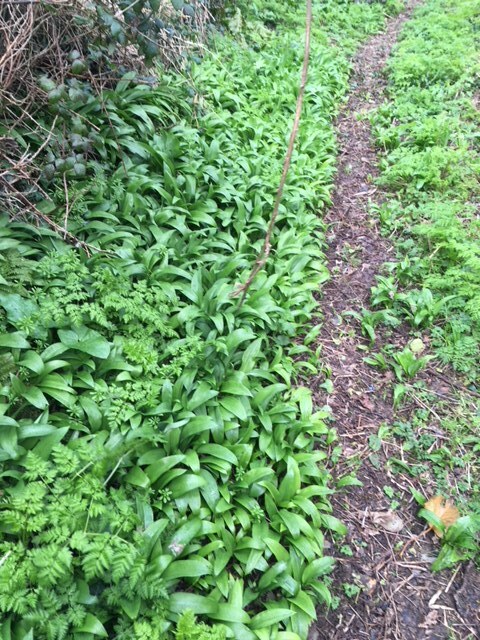 Up near the top the mud dries up and there is so much wild garlic growing along the way that garlic is the only smell. I cannot smell the mud nor any of the other young green things. The entire length of the path smells like garlic. Simon shouted for me to come outside. He said he’d seen the biggest stoat ever and it was under our wood pile. The stoat stuck his head out and looked at us both and then it went back in. It looked too big to be a stoat. We did not know what it was. It went in and out, and around the back, and in and out again, and it studied us without fear and with a lot of interest. It had a nice face. I took a few photographs as it took off and ran across the grass. When it ran it moved low along the ground with large elongated flexing and bouncing movements, sort of like a hare. It was black and sleek and long. A little later we were down at the shop. I asked the blonde woman behind the counter if she knew her animals. She said she did. She looked and said that she did not know what it was but that it was Not a stoat. She called Marian over and Marian said it looked like a stoat but it was too big for a stoat. My phone was being passed around. I thought it looked like a mink but I did not know if minks were native. Marie had a look and said it is more mink than stoat. There were six people discussing the animal now with each other and with Simon and I. My phone kept being grabbed and the photos studied and enlarged as everyone tried to solve it. Someone suggested a pine marten but others put that idea down scornfully. It was too sleek and too thin to be a pine marten. Without exception everyone disliked the pine marten as a possibility and as an animal. John Condon walked into the shop and Marie said “Here’s the man to sort this!” Someone handed my phone to John. He recoiled from it and said he did not have his glasses. The photos were enlarged yet again and shown to him. We all said what we thought it was or was not. Everyone was talking at the same time. John looked at the phone with care and shouted, “It’s a Water Dog!” There was a group sigh of agreement. Of course, a water dog! I had no idea what a water dog was. 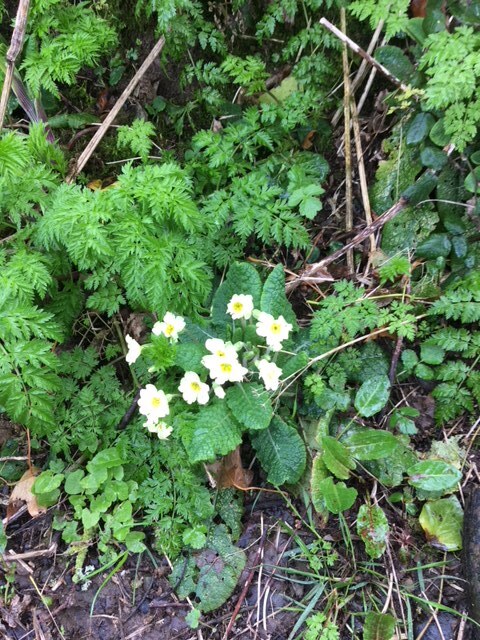 They all agreed it needed water nearby and Simon mentioned the stream at the bottom of our meadow. John made a flexing movement with his body and his back. He said, “It moves like this.” He imitated the movement exactly right. I looked up water dog when I got home and found all kinds of dogs, mostly Portuguese, which were called Water Dogs but not one of them looked like our animal. 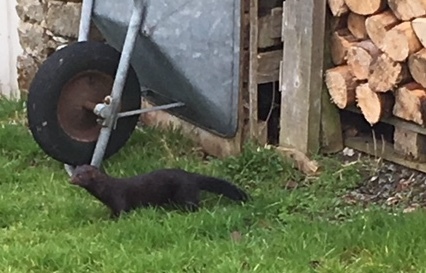 Eventually I found a picture of what we had seen and it was indeed a mink. I admired his fancy designer spectacles. I could see they were new. Since I had never seen him wearing any glasses at all before this, I asked if he had always worn them. In fact, he said he had never worn glasses, but he had been instructed to wear them twenty years ago. He said it was hard enough being gay in school. He said that wearing glasses would have finished him off. I asked what wearing the new glasses did for his vision. He claimed that the world was a new place. When I suggested that poor vision was a liability in his line of work, he looked at me in the mirror and we both fell about laughing. He said that every head of hair he cuts now is a brand new head of hair even if it is a head of hair he has been working on every week for the last fifteen years.